These homemade butternut squash ravioli in a brown butter sage walnut sauce are not hard to make if you follow our instructions, and they turn out light, delicate and extremely delicious. Today I faced one of my greatest fears in cooking. Making fresh ravioli pasta. I was a bit anxious starting but soon got into a groove and things fell into place. We all seem to think that to make a recipe from scratch is such a laborious and tedious task, but here I am, a living proof. It was not only easy, but a lot of fun to do. Most of all they were light, delicate, and extremely delicious. Without further a due here is the recipe for butternut squash ravioli in a brown butter sage walnut sauce. I hope you enjoy and have fun making it. Remember: it is not the destination but the journey that makes it worth something. To begin, preheat your oven to 350° F. Cut the butternut squash in half and use a spoon to clean out the seeds and pulp. Place two halves of squash on a baking sheet inside side up. Drizzle the 1 tablespoon of the e.v.o. (extra virgin olive oil) on the two halves. Sprinkle with salt and pepper, rosemary, thyme, parsley, chili flakes. Place butternut squash face down on the baking sheet and place two cloves of garlic one in each squash. Place in middle rack of oven and cook till knife pieces easily into the skin side of the squash. Take out of oven when done, let cool, then scrape all the meat out of the squash. Take the cooked garlic and mash with squash. Set aside. In a food processor blend 1 ½ cups flour with 2 eggs and ¼ tsp salt. Add a bit of water at a time into the food processor till the mixture becomes a workable dough. Take out of processor and place on a lightly floured surface and work for about a minute till it becomes soft and pliable. Cover with plastic and let sit in the fridge for 30 minutes. Take the dough out of the fridge. Cut into four equal parts. Lightly dust a work surface with flour and work the dough with a rolling pin into a large square roughly 12 inches by 12 inches, then do the same with the other 3 pieces of dough left. When dough is all rolled out put aside on a lightly floured surface. Take square cut into 3 inch strips and set side by side. Cut any excess dough out and set aside. In a bowl mix up one egg and a spoon of cold water. Brush the dough strips. Take squash out of the fridge and mix in ¼ cups ricotta cheese, 1/5 cup of parmigiano reggiano. With a teaspoon place one spoon of squash mixture onto dough with egg wash on it. Make sure you have room to press all around the center. 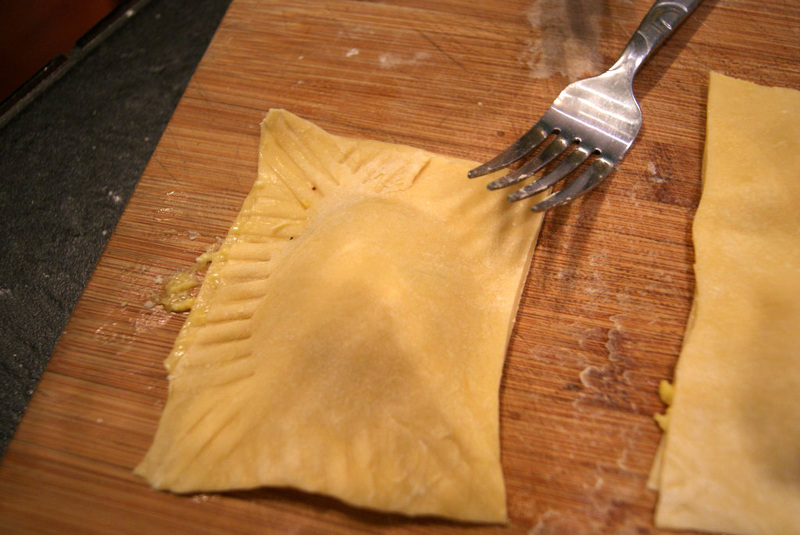 Strips should make at least 3 large ravioli, but you can make them any size you want. Brush egg wash on the other strip of dough and place on top of the dough with the squash. Press dough together working all around the filling to make sure dough is sealed. With a sharp knife cut the squares apart and with a fork press all four edges of the ravioli and place on a slightly floured baking sheet. Repeat this process till dough is finished. You may have some filling left over, not to worry, it can be used for others things like eat it like that, or even make a soup. Start a large pot of water to boil, and salt to taste. Chop finely a small clove of garlic. Chop up some fresh sage and leave some leaves whole. In a large pan heat up butter and place remaining 1 table spoon of extra virgin olive oil into the pan. As the butter begins to brown put in garlic, sage, and walnuts , and take off heat. Place butternut squash ravioli into the boiling water cook till they float to the top of the water, roughly 5-6 minutes. 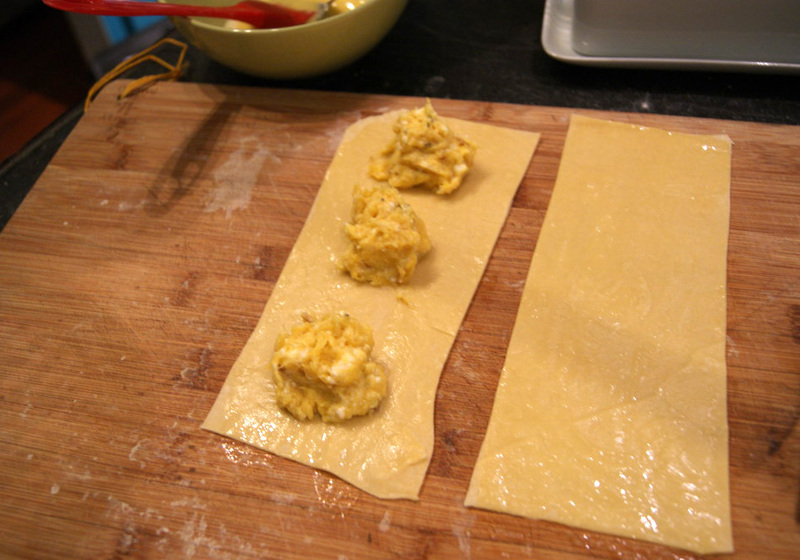 With a slotted large spoon take ravioli out and put on a plate. Spoon brown butter mixture over the ravioli. Sprinkle with parmigiano and lemon zest. Top with a dusting of parsley. Dedicated to my beautiful wife.